Frederick Rigby was born in Coleraine in 1895 to Edwin Rigby and Margaret Catherine Shaw. In 1906, Edwin died at Coleraine aged just thirty-seven, so Margaret moved her family to North Hamilton. Frederick became a blacksmith when he finished school and joined the local 20th Light Horse Regiment (LHR). On Friday 21 August 1914, Hamilton stood still for what the Hamilton Spectator described as a “stirring afternoon” as local men, reported as the remaining group of men in Hamilton’s quota of enlistments, left for training. The war was only weeks old and little did they know, the scene would be repeated over the following years. The men marching that day were representatives of the 20th LHR and among them was Frederick Rigby. Fourteen locally bred horses also joined them on their trip to Broadmeadows. Frederick left Australia with the 4th LHR on 14 October 1914 for Egypt. His service record gives no clue if he went to Gallipoli the following year with the 4th LHR. It picks up from well after the 4th LHR returned from Gallipoli, at the time of the 2nd Anzac Mounted Regiment’s formation, of which Frederick became part of and soon after he left for France. Writing home to his mother not long after arriving in France, Fred expressed his pleasure at being at war. Presumably, he had endured Gallipoli and time in Egypt, but I wonder if his sentiments were the same a year later after twelve months service in France. And was his bravado connected to his refusal to make a will? “Hamilton Spectator.” Hamilton Spectator (Vic. : 1870 – 1873; 1914 – 1918) 30 Jun 1916: 4. <http://nla.gov.au/nla.news-article133702282&gt;. In August 1917, Frederick had an attack of appendicitis, something he had suffered twice before. On this occasion, he was transported to England and underwent an operation on 20 August at the Fulham Medical Hospital. Frederick returned to France in February 1918 to join the XXII Anzac Corps. The XXII Anzac Corps was in action on Mount Kemmel, France on 18 April 1918 when shelled heavily. At 2:00pm, a shell hit Frederick’s trench killing him and another man instantly. He was buried where he fell and a makeshift cross erected. On that day, the XXII Anzac Corps had more casualties than any other day of the war. Frederick had been a soldier almost since the start of the war and died five months from Armistice. 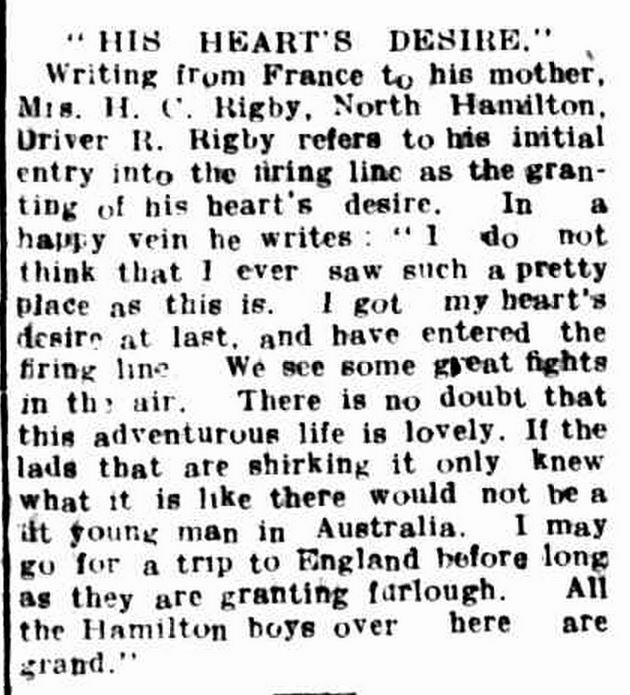 On 23 July 1918, the Hamilton Spectator published a letter received by Frederick’s mother Margaret. 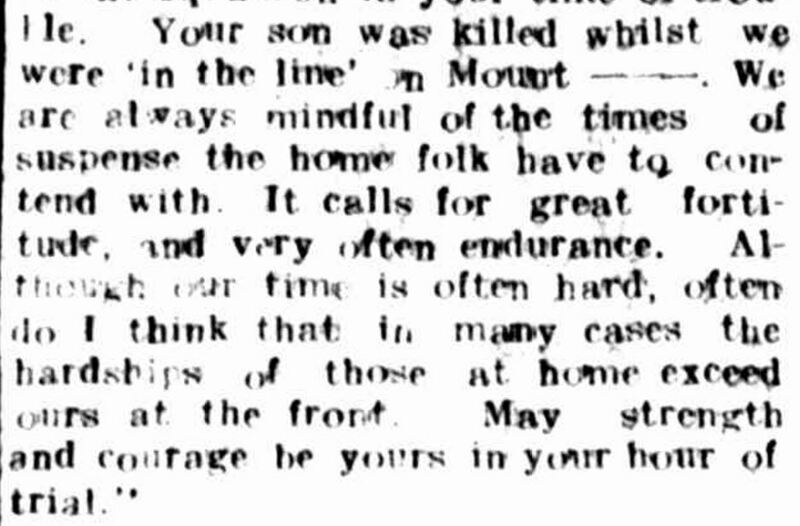 It was from Lieutenant Pearce of the XXII Anzac Corps, expressing his condolences on the loss of Frederick. He acknowledged the difficulties experienced by those left at home. “THE LATE PRIVATE F.R. RIGBY.” Hamilton Spectator (Vic. : 1870 – 1873; 1914 – 1918) 23 Jul 1918: <http://nla.gov.au/nla.news-article119504475&gt;. 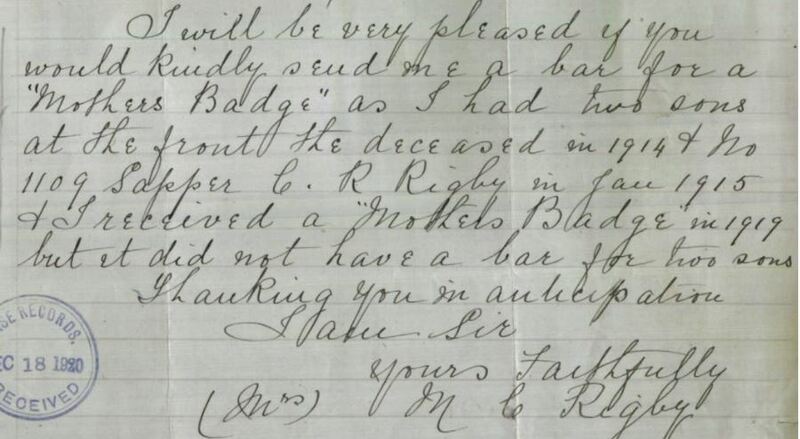 In 1920, Margaret Rigby contacted Base Records requesting a bar to add to her “Mothers Badge” that would signify her two boys who served.